Exercising is one of the best things you can do for your body. Exercising outdoors can be even better! This summer, take advantage of the beautiful weather to better your body – workouts performed in fresh air and sunshine can multiply the many great benefits of physical activity. But if you’re bored of simply walking and running, there are plenty other activities that will give you a whole-body workout – while keeping things interesting. Learn about the benefits of exercising outdoors, and discover new heart-pumping, muscle-toning, brain-boosting workouts to try during National Great Outdoors Month. Regular exercise can help control weight, build muscle, prevent cardiovascular disease and reduce the risk of certain cancers. And when you exercise outside, you add sun and fresh air to the mix. Sunshine is a major source of Vitamin D, which can help reduce the risk of type 2 diabetes and cancer, build strong bones, protect eye health and strengthen your immune system. Fresh air also helps keep your lungs healthy. Give these 5 activities a shot – or other fun ones you’ve been wanting to try – and start incorporating sunshine, fresh air and excitement into your workout. Yoga by itself yields great benefits for the entire body. Posing with power strengthens your core, improves flexibility and helps clear the mind. On a standup paddleboard, the benefits of yoga are even greater. Your muscles work harder to help you maintain your balance as you float on tranquil water. The ocean also has a calming effect, increasing the brain-enhancing power of exercise. This thrilling combination of frisbee and golf provides a great workout for your arms and legs. As you attempt to make par by tossing a frisbee into a distant target, you use your arm and leg muscles to build momentum on your throw. Walking or jogging from goal to goal can help keep your heart healthy and make you feel happier. And, your brain gets a workout when you strategize how to get around obstacles. At first glance, it might seem that fishing isn’t physically beneficial, but the calories you burn really add up from all of the activities involved – carrying your gear to your boat, rowing out, assembling your rod and casting your bait into the water. In fact, an average adult can burn around 172 calories per hour of fishing. Letting your mind wander while you wait for a fish to tug your line can also help you relax and reduce stress. When you eat the fish you catch, you benefit from omega-3 fatty acids, which are essential for the brain and heart to function. Rock climbing can be a especially challenging, but that makes it all the more gratifying when you get to the top. Whether you are a seasoned climber or just starting out, rock climbing offers many health benefits. Climbing at a moderate intensity for just 1 hour can burn nearly 400 calories, all while working out arm, chest, back and leg muscles. Climbing also provides cardiovascular exercise to help keep your heart functioning as it should. A common misconception about horseback riding is that the horse is the only one getting the exercise. But the truth is quite the contrary. Horseback riding requires consistent balance and coordination to stay upright – especially if you ride without a saddle. Flexing and contracting your muscles to stay on the horse – as it rapidly changes direction and speed – help improve muscle tone. Your riding position can also help improve flexibility and strengthen back muscles. 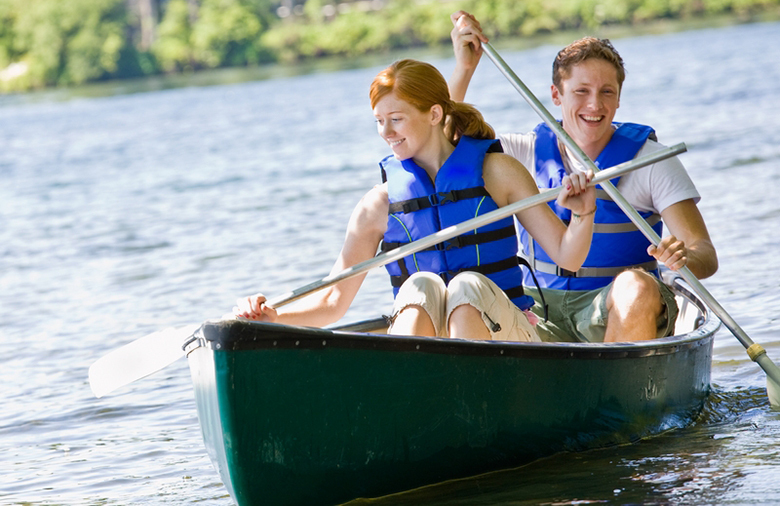 If you think a friend or family member might benefit from learning about these fun outdoor summer activities, feel free to share this article with them.